Entranced by time and location and the body’s longings, this is a book of self-translation. 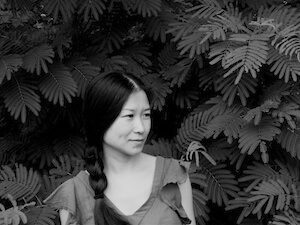 Each poem has gone through a transmigration process, as the poet negotiates between her native Chinese and her adopted English, attempting to condense, distill, and expand seeing and understanding. I used to stand before lantern puzzles. my window with the sound of trains. are for people in the yellow space. the houses they build remain empty. Ye Chun (叶春) is the author of a book of poetry, Travel Over Water (The Bitter Oleander, 2005), and a 2011 novel in Chinese, Peach Tree In The Sea (《海上的桃树》). She holds an MFA from the University of Virginia and is completing a doctorate at the University of Missouri.